Tillman had been hired by CEO, Bill McDermott, with a mission to elevate SAP into the ranks of the 10 most valuable brands in the world, from its position at 21st at that time. So in her first two months she had examined the company’s 46-year history, all the way back to the reasons it was founded by five former IBM executives in 1972 who believed they could build something that would make the world a better place. 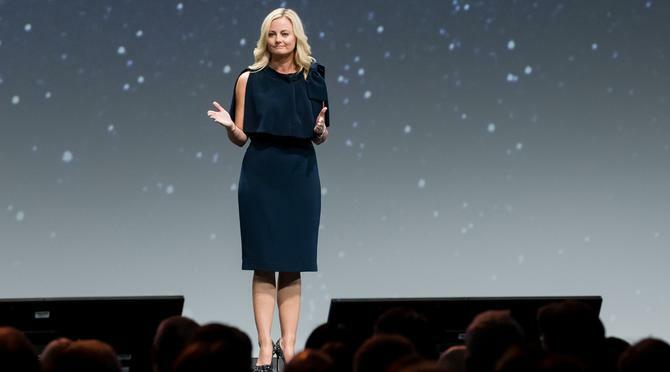 Tillman knew she needed something bold, so the strategy she would present to the board would set aside decades of product-based marketing of SAP’s core enterprise resource planning (ERP) software. “I said we had a real opportunity to stop telling a pure ERP story, and start telling a story of impact into things that people really care about, because it is incredibly aligned to our mission,” Tillman tells CMO. The decision to focus on purpose rose directly from Tillman’s investigation of the commonalties amongst those brands that were already rated as the ten most valuable. While all were consumer-facing to some extent (SAP purely sells to business) she saw four traits that could be applied to her company – consistency in communication, ability to set the tone for markets, relentless pursuit of customer experience, and a strong sense of purpose. It was the last one she latched on to in her presentation. “We are probably the most unknown, largest enterprise application B2B brand on the planet,” Tillman says. “So despite the size - US$30 billion in revenue, 94,000 employees and 400,000 customers in 180 countries – there is not widespread brand recognition like you’d expect. And I thought why not? SAP adopted a new slogan of ‘The best-run businesses make the world run better’ and hired actor, Clive Owen, to front a campaign that kicked off in April this year. Rather than simply waving the metaphorical flag for purpose, the campaign showcased customers, their objectives, and the impact they had. “Sure my logo is on it, but it is more about what the customers are doing and how they are using SAP technology to make that difference,” Tillman says. The overarching goal was to demonstrate the obligation of leadership in companies today to know their place in helping the world. Tillman acknowledges that shifting SAP’s focus back to being a purpose-driven organisation would take more than just fancy marketing. Hence she knew she had to align the board and the rest of the senior leadership team with her vision. That simply meant reminding them of why the company had been successful and how it could become more successful and more differentiated in the future. Within her own function, Tillman has set about tackling the problems she sees – particularly in the area of diversity. And she has an expectation SAP’s agencies will follow suite. While she is yet to sack an agency over diversity, she says it is a regular topic of conversation, and one she believes that is essential to SAP’s overall long term success. All of which aligns well with Tillman’s focus on SAP being a purpose-driven company. She believes marketers sit at a crossroads today, where on one hand they have access to vast reams of data they can use to make better decisions, yet on the other side a number of movements have emerged aggressively around gender equality and social good. “And so you sit here now at a crossroads, because the data is more likely going to point to a more conservative point of view, otherwise you risk impacts to your bottom line,” Tillman says. “But you have it coming against this notion of doing good, making decisions based on your values, using your platforms to give people a voice where others don’t have those abilities. And for those organisations that have perhaps lost their sense of purpose, as she believes SAP might have done somewhere its in 46-year history, she has a very clear message - go back to why you were founded. Brad Howarth travelled to SAP Customer Experience as a guest of SAP.